The Gorburger Show is no longer. According to The Hollywood Reporter, Comedy Central has cancelled the TV show after only one season. From TJ Miller, the alternative talk show originated as a digital short on Funny or Die. 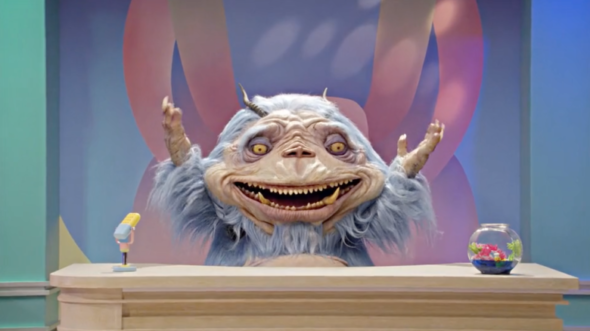 In the series, Miller voices Gorburger, a giant blue monster “who, after invading a Japanese television variety show and enslaving its staff, broadcasts from Japan and interviews guests in an attempt to understand what it means to be human.” Previous guests have included Jack Black, Carson Daly, Henry Rollins, Flea, Wayne Coyne, Eagles of Death Metal, Grouplove, and Tegan and Sara. The cancellation was announced around the same time allegations of sexual misconduct were made against star TJ Miller. However, Comedy Central says they decided to cancel The Gorburger Show before these allegations were made public. What do you think? Did you watch The Gorburger Show? Are you sad it’s been cancelled? More about: Comedy Central TV shows: canceled or renewed?, The Gorburger Show, The Gorburger Show: canceled or renewed?